The Först slogan says it all... ‘Rely on it’. Först is a brand developed out of a clear view of and a focus on excellence. This is a brand built by a combination of exceptional industry knowledge and engineering excellence - there are no compromises... For genuine rock solid build quality, astounding performance and an unrivalled national backup support network – look no further. What better way to get new, fully maintained machinery without the cash outlay? 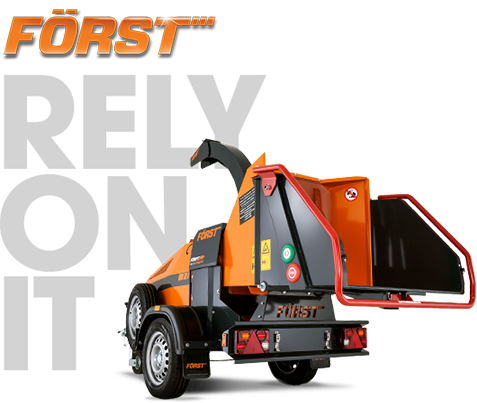 Contract Hire gives you the peace of mind of fully maintained working wood chippers at a fixed monthly cost. All servicing is covered making your job simple and straight forward. When you buy from Redwood Global you become much more than just a customer. You become part of the Redwood family, one who is backed and valued every step of the way. We measure our success on the impact we have on our customers’ lives and organisations, we love to see you thrive. We supply a product and service which is critical for the success and efficiency of your company; look no further for guaranteed peace of mind, performance and above all true value for money. Get parts for your Wood Chipper now! Redwood Global has one of the largest Wood Chipper spare parts stock in the UK available with expert knowledge and a fantastic service. Parts held on the shelf for same day collection or next day delivery across the UK. As the manufacturer of Först machines we have a huge spare parts stock here in Hampshire at your disposal!